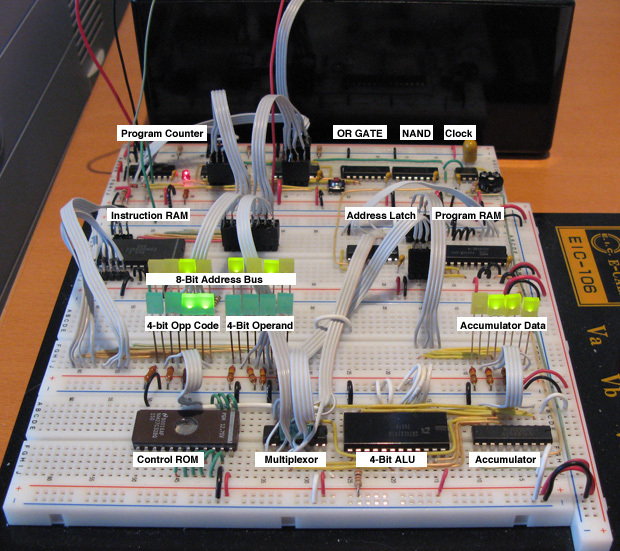 Andrew Wasson built a 4-bit machine on breadboard - much less of a barrier to entry than wirewrap or PCB! Be sure to visit the links on the right of the page for more details. can you tell which ic was used as accumulator?? @computerprj: Just follow the link in BigEd's post. The design is described there, including the accumulator. I went through the entire 4-bit TTL CPU section of the site right after Ed posted, and I was not able to tell what IC is used for the accumulator either. Even the schematics page shows only two very minimal schematics and no links to others. I do enjoy seeing projects like this though. It's not likely to be updated either - the project is a few years old. But then, there are quite a number of TTL CPUs around, so it's easy to enough to have a look to see what they use. In fact, it's important to have a look, because a habit of asking people questions which can easily be answered by some simple research is a way to lose goodwill and be unwelcome in a community. Conversely, do the research and write up your findings in a post, and that's a good way to gain goodwill. I went through the entire 4-bit TTL CPU section of the site right after Ed posted, and I was not able to tell what IC is used for the accumulator either. Hm.. I found it after about five seconds. Click the My CPU Design link, scroll down to Arithmetic Logic Unit, it's right there. computerprj found it too (as per his PM). It's a 74LS181. I think that the '181 is the ALU, not the accumulator, Tor. I imagine that a quad D flip-flop (like a '175) would make a nice 4-bit accumulator, but I couldn't confirm that from the information posted, even after spending much more than five seconds looking though the site. Yes, according to the labels in the picture, the ALU and accumulator are separate ICs. My fault - sorry everybody - I have no idea why I kept reading alu when it was said 'accumulator'. But I did that repeatedly. I can't find an ID for the accumulator either. Something in a narrow DIP20. Something in a narrow DIP20. Which would likely be an octal flipflop -- probably either 74xx374 or 74xx574 -- and a close look at the photo rules out the '574 because the latter has all the data inputs on one side of the package and all the outputs on the other, so I'd expect to see at least four yellow wires connected on each side. Instead it seems almost all the pins on one side are unused, and on the other side most or all of the pins are used. So, if I had to bet I'd say it's a 74xx374 flipflop. But '273 and '377 are also octal flipflops, with much the same pinout, and are also possibilities. Last edited by Dr Jefyll on Fri Jun 30, 2017 1:26 pm, edited 1 time in total. what octal flip flop do? It's a synchronous latch. It has many possible uses, but in this case it is used to hold bits of binary "data" for use by the ALU. When the data needs to be updated, an "update" signal is triggered, and the "old" bits are discarded and replaced with the "new" bits present on the input pins at the moment of the trigger. So, it's essentially eight bits of very fast memory, AKA "register".